If you ever work from home or just to need a space to manage household admin, a desk is an essential part of any home. From stand alone pieces to space optimising folding desks, Lozi can create a variety of desk set-ups to fit your lifestyle. Michael’s beautiful desk nestles discreetly in an alcove in her living room. The curved edges bring a relaxed feel to this office space, tying it in with the rest of the living room whilst a neat shelf above is perfect for storing files and displaying valued records. Making the most of an awkward corner, where the walls meet at a challenging 73.5 degrees, Jessica’s desk ties in with the rest of her small space, putting the final touches to her House of Lozi flat. The underneath storage cabinet hides away unsightly computer equipment whilst the oak veneer and green paint finish matches her kitchen island, tying the whole space together. 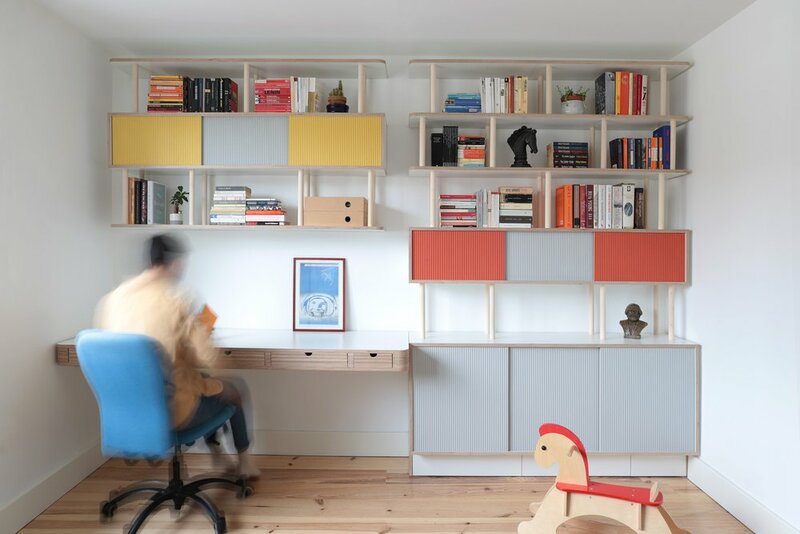 Book editor Ilaria needed plenty of storage space for her home office in East London. Her ample book collection needed its own space and she wanted a quiet and peaceful place to work from, away from the busy distractions of family life. Lozi created this combination of bookshelves, cupboards, free-hanging desk and open plan shelving to suit her needs. Colourful highlights make the room child friendly for her two toddlers, and the space could ultimately be turned into a kids bedroom if needed. Underneath the stairs, a very skinny folding desk allows this family to have a designated office space without having to dedicate an entire room to it. This design folds out into a large desk area when needed whilst only being 15 cm deep when put away. A modular peg board creates flexible display space for small decorative items or to do lists and a cupboard underneath is the perfect depth for ring binders and other office equipment.